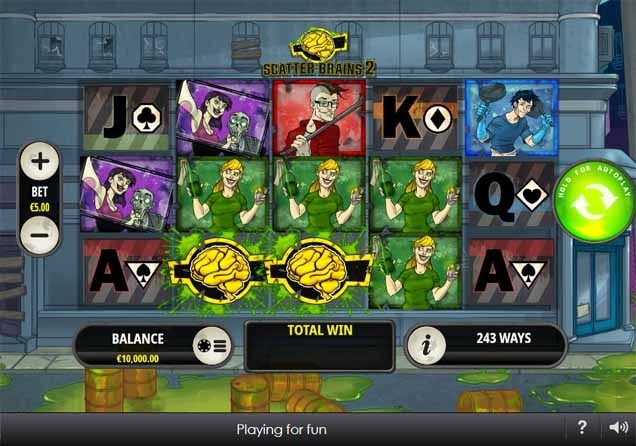 Scatter Brains 2 arrives at Slot Game UK to play for free! The original Scatter Brain video slot was produced by Geco Gaming. In response to its success, Playtech bought Geco and then released Scatter Brains 2. Fans of the original game will love its sequel just as much. Though its zombie theme is far from unique, players have embraced the game anyway. The game is set in the streets of a damaged city. The city has endured a chemical spill that led to physical disaster for the area. For that reason, the characters in Scatter Brain 2 are all armed with their own weapon. The characters serve as the main symbols on the reels. The wild symbol in the game is a biohazard warning sign in bright red. A yellow glowing, radioactive brain is the scatter symbol. When players get a winning combination of symbols that pays out well, the screen explodes with graphics. These include the teeth, eyeballs and hearts of zombies. Not surprisingly, brains trigger the bonus feature. When the brain appears on the second, third and fourth reels in one spin, free spins are triggered. Players start out with five of them. While free spins are taking place, the radioactive brain disappears. It is replaced with the wild symbol red brain. Then the red brain glows like the radioactive one did. Every time a free spin ends, three zombies amble across the reels. They resemble the walking dead characters when they do this. When they walk over the reels they turn them wild. As each character becomes a wild, they go from being alive to undead. Getting the undead on the reels respins them. Respins cause the zombies on the reels to glow. The lowest paying symbols on the reels then disappear. The fun continues with walking dead wilds. Wild symbols then have the ability to triple a player’s winnings. This can lead to big paydays for lucky players. Scatter Brain and Scatter Brain 2 have more differences than most players would expect. Though the bonus games are similar in the original and the sequel, the design is quite different. Players who haven’t experienced the first Scatter Brain won’t notice this. The two games are completely independent of each other. Someone that has never played the first one can still enjoy its sequel. While the Scatter Brains 2 bonus may confuse players at first, they will quickly get used to it. The triggering of respins is one thing that keeps players going. It is the most exciting feature of the game. The excitement also comes from the background music that plays. When the reels are spun, the high energy music accompanies it. This offers players the motivation that keeps them spinning the reels to see where they land.